Like an Haute Couture gown this golden fragrance envelops with its divine golden hues for a lasting enchanting memory. The woman who wears it is sublime and sensual, like a modern goddess. 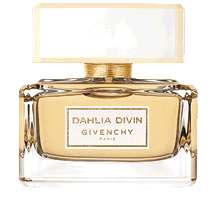 Dahlia Divin makes it perfumery debut with notes of golden fruit; Mirabelle Plum. Entwined with the aroma of a bouquet of white flowers, highlighted by Jasmine like a ray of pure light. The fragrance develops fully with the rich alluring woody tones of Sandalwood for a strikingly delightful area. Alicia Keys, with her golden velvety skin, her voice, her beauty are an endless source of inspiration for everyone, especially for the couture designer. She wears the perfume as an Haute Couture dress, a quintessential object glorifying her talent and her iconic elegance.